Oh happy day! 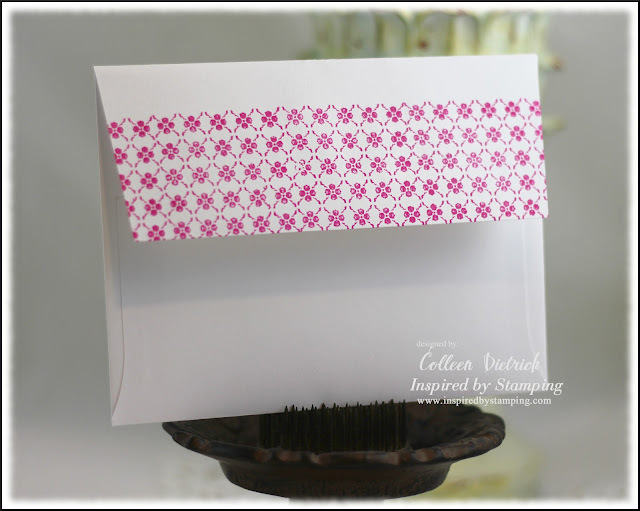 This is my first official post as a new Design Team member for 'Inspired by Stamping'! I am so excited to show you projects using the new June releases, which are available in the store tomorrow. There's a FREE shipping deal and a chance to win Blog Candy, so please read on! Up first: a card and gift set using Elegant Flowers and Little Phrases II. This set is for my 10 YO's teacher, who is an amazing instructor as well as a lovely woman. I love the Elegant Flowers set. This image reminds me of old-fashioned roses that we inherited with our current house. I used a leaf ribbon as my stem, and added pearls to the center of the flower. The set, Little Phrases II, is so versatile. One day I came up with about 20 different phrases I can put together using the words included! Here, I used two words, ransom-style. I am (finally) the proud owner of seam binding. :-) It sure does make beautiful, soft bows: no wonder everyone loves the stuff. My daughter's teacher is a paper crafter, too, so I made her a gift I know she could use: a collection of labels, all die cut and ready for sentiments. I used the set, Fancy Label 18, to create the labels. The bag topper is made from the same patterned paper as the card, with a Spellbinders Fleur de Lis die. I used a cereal box to create the punched heart, then rubbed chalk ink over it (supplies at the end of the post). 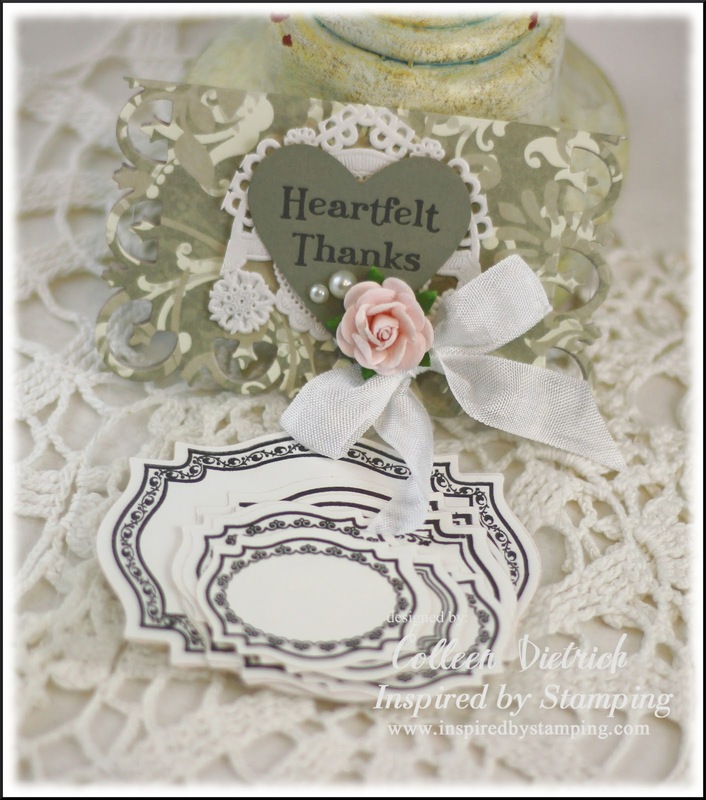 Once again I used the new IBS set, Little Phrases II, to create a sentiment. There's a bit of a 'semi-vintage' doily (well, those doilies are over 20 years old, and by some definitions can be called vintage) behind the heart. The pretty pink flower is from IBS. My last project is a bright, fun birthday card. I've combined three new sets here: Background Basics, Vintage Sayings and Little Phrases II. I used a background stamp, stamped in three different colors and then punched out. Those punched shapes were arranged on a card base, and I loooove how it turned out!! 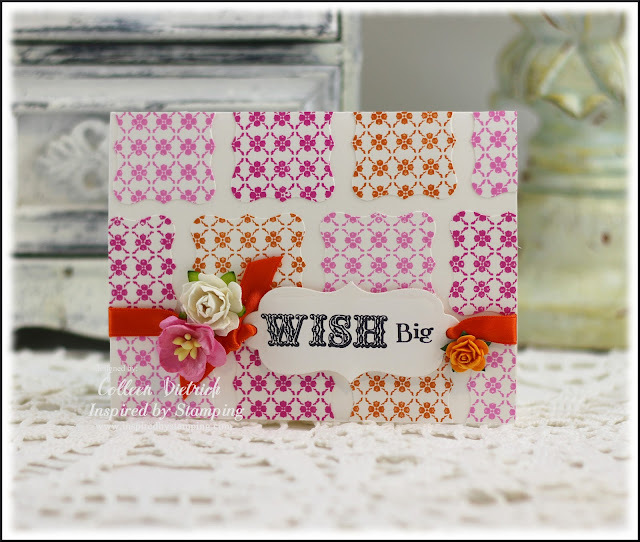 "WISH" is from Vintage Sayings, a collection of four one-word sentiments in an eclectic mix of fonts. "Big" comes from Little Phrases II (so versatile, I'm tellin' ya!). Those pretty little posies are available in the IBS store, too (links at the bottom of this post). I thought the envelope deserved a little fun decoration too! 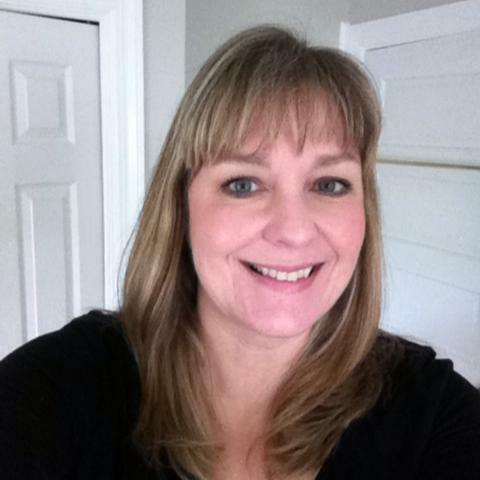 Owner Joanna Munster is giving away blog candy! One lucky customer will receive their choice of 1 - 6x8, 1- 4x6 and the Vintage Sayings stamp sets. Check out Joanna's blog for the details. There's free shipping on everything in the store, good on Friday and Saturday only. The code is: freeshipping. Happy shopping! Thank you SO much for dropping by! I always appreciate your visit. Paper: Elegance - K & Co.
Wow, wish I taught your children!!! This card is absolutely beautiful and the style is one of the reasons I like to visit your blog! I like all the things you've posted here but the top card remains my favourite. Beautiful work! 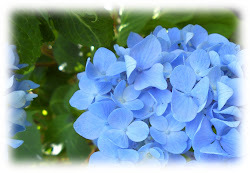 Love your coloring of the beautiful flower!! Your daughter's techer will love the labels, what a sweet idea! Love the colors you used on the wish big card along with what you did with the background stamp! These projects are great Colleen. I love how you colored the flower in the first one. I can't have enough places to put sentiments, I know your daughter with use those labels quickly. And, of course, I'm partial to the bright colors and graphic design of the last one. You've been busy!! Wow! Love all these projects! How thoughtful of you to make the labels. She is sure to love them. Beautiful projects as always! WOW, WOW, WOW!!! These creations are all just beautiful and SO inspiring!!! Your did a fabulous job of showcasing these stamps:) I love the gorgeous flower on the first card-awesome bow too!! 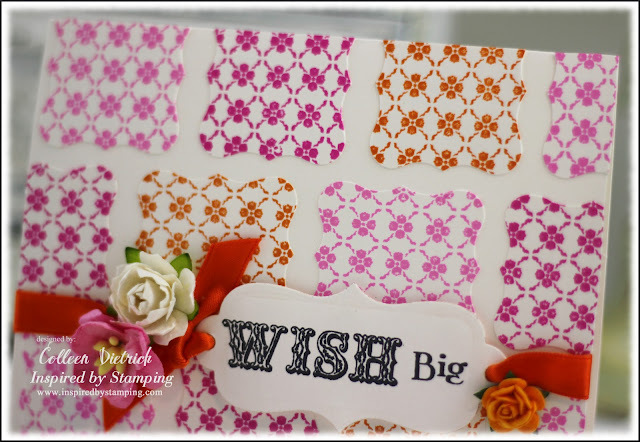 Love how you did the background on this card-awesome colors and awesome matching envelope. beautiful projects! the coloring on your rose is perfect! Gorgeous BG DP on the first card and the flower is stunning. Fun patchwork and colour combo on the second. Great cards! Really love the coloring on the first and the great bright colors of the second. BEAUTIFUL first outing Colleen, stunning card! Great idea for your teacher gift too. And your cheerful birthday card is pretty! Wow, that first card is so beautifully chic! What a beautiful roses. And I loooove the bright Birthday card with the pretty punched pieces! Both cards look fabulous my friend. I just love the flower on the first card. You colored it so pretty. And I just love all the happy colors on your second card.. I do hope you are having a happy week my friend. Lucky teacher!!! Lovely cards, Colleen! I will click over and check out the candy. VERY pretty!! And I LOOOOVE your teacher's gift idea!! Ingenious!! These are beautiful, Col! You always do beautiful so well, and your seam binding looks perfect ;)! So glad you got your inky, little fingers on some! Beautiful card for the teacher and a gift she is sure to enjoy. I like your staging on that photo, too. Your next card is so fun and colorful...a real showstopper. OMGoodness, these are absolutely FABULOUS!! So very pretty! You're off to a great start. I especially love your very creative design for the "wish" card. Gorgeous! Love both cards and the stamped envelope. All beautiful...lucky girl...you get to play with those awesome stamps! And make some awesomeness yourself!